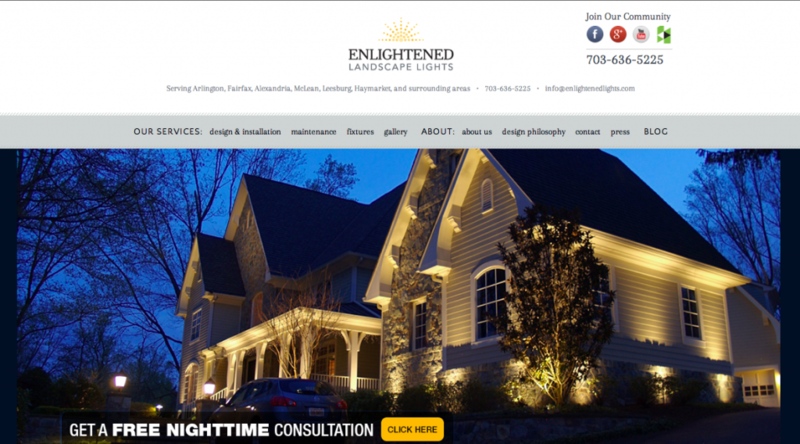 Lani is a guest contributor to Enlightened Lighting’s blog. She writes weekly posts about landscape lighting. Curb appeal isn’t just about a manicured lawn or a nice paint job. If you want your home to be the talk of the town, you have to consider how it will look when the sun goes down. The key to a stunning home is outdoor lighting. Poor lighting can make a gorgeous house look dull, but great lighting can make your home shine! Here are the five most common outdoor lighting mistakes – and how you can avoid them. Oversimplified lighting (such as an overuse of large floodlights) results in a lack of contrast that will make your home appear flat and boring. Carefully planned outdoor lighting design will create drama and highlight your home’s best features. This is accomplished by incorporating layers of light and using shadows. Unlike sunlight, lighting we design can be applied selectively to draw the eye to certain areas. First, it’s important to determine the focal point of the design and create a lighting hierarchy. At Enlightened Lighting, designers consider how the home looks from all angles – not just from the street, but also from the entryway, from a deck or patio, and even from inside the house. This creates depth. Then, a plan is drawn up to include layers of primary, secondary, background and soft lighting, as well as dark areas to create contrast. The end result? A stunning, dramatic view of your home! Even a dramatic lighting scheme can be ruined by lighting glare. If a contractor is careless and doesn’t position a fixture properly (we’ll explain this more later), you’ll end up with an eyesore that looks like a reflection from a flashbulb. Eliminating lighting glare will prevent distractions and allow the eye to focus on the whole picture, rather than a bright blemish. Lighting glare can be easily fixed by using frosted lenses or shrouds, and by considering the angle of the light. Just as the wrong angle can create lighting glare, bad fixture placement can result in over-illumination or an imbalance in the overall look of the home. Our goal at Enlightened Lighting is to create understated elegance. Depending on the object we are lighting, we aim to diffuse the light to create a subtle and even appearance. For instance, on a larger tree, one light under the trunk may create an unwanted hot spot, whereas using 2-3 fixtures spread out around the tree will create a more balanced look. Different fixtures have different color temperatures, and these color temperatures set the mood of your design. If the color temperature in a fixture is too warm, it will produce a yellow-tinted light, which can appear dirty or dated. A light that is too white can create a commercial, sterile feel. Fixtures that create a bluish hue can make your home look dreary when not used for a specific purpose, such as moon lighting. It’s crucial to find the perfect color balance to accomplish your desired look. Also, look for consistency among all of the fixtures you choose. Don’t forget to consider how a fixture’s color temperature can shift as it burns out, which could result in inconsistency down the road. When you spend time and money to create a beautiful design plan for your outdoor lighting, the last thing you want is for it to be ruined by under-powered lights. If a light beam isn’t sufficient for the task at hand, a well thought out design will fall flat. For instance, a light beam might only extend halfway up an object, or the spread of light might be too weak to wash a large area. The cheap, battery and solar-powered lights tend to be under-powered and appear dim, undermining a high quality outdoor lighting design.